Recently Kate and I had the opportunity to test out several new products from Pillsbury (you know we didn’t hesitate to say yes to that offer!) One of the products is the new Crescent Recipe Creations. (Check out that link for tons of great recipes) Basically, it’s their well-known crescent dough, but without perforations. It’s just one big sheet. For years I’ve thought they should sell it in a sheet and wa-lah! Such a great product. It’s pretty much a blank canvas for anything you can dream up. It took me a long time to even use it because I couldn’t decide what to make! It wasn’t until recently, when I need a yummy “special” breakfast for a morning event that I had the idea to make this braided pastry. (I won’t lie. 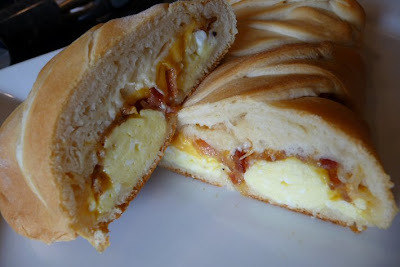 I have a slight obsession with breakfast sandwiches so it didn’t take much for me to imagine this one up.) It looks fancy, but is SO easy, and with the crescent sheet, it comes together in minutes. I’m going to show you step by step how to create the same thing, but it’s a method you can easily personalize in so many ways. I do this a lot with breads and I thought this crescent sheet would be perfect for it too. You’ll create a gorgeous filled braid that people will think you spent hours on! It’s seriously so easy- have I mentioned that? You could make a sweet braid filled with apple pie filling, or try a sweetened cream cheese with some fruit jam and put a glaze on top. Pizza fillings would be awesome too, or plain cheese and then dipped in marinara. I could go on and on… Just watch. A yummy and easy breakfast braid, great to feed a crowd on a busy morning! 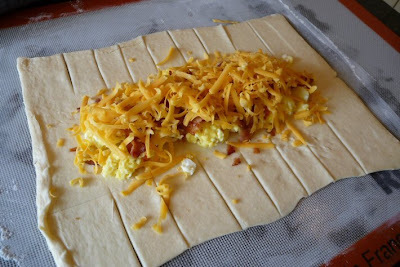 Next, use a rolling pin and a lightly floured work surface to roll out the crescent dough to about 10 in x 12 in. Lay the eggs down the center of the rectangle, leaving room on both sides and the 2 ends. Top with bacon, cheese, and a couple shots of hot sauce if you want. Use a pizza cutter to slice even slits on the sides of your rectangle. Fold over both ends. Now starting on one end, bring the side pieces in and overlap them. You’ll want to alternate- one from the right, then one from the left and so on and so on. Keep doing it until you get all the way to the end. When you get to the end, just tuck where you can to make it pretty! Bake according to package instructions. I believe it’s 375 for about 15-20 minutes (but who knows, I threw away my package!) It might take a little longer than the package directs because of the way it’s braided. When it’s done, it should be golden brown on top. Remove from oven and let cool for about 5 minutes. Slice on a slight diagonal and eat immediately! If you want it shiny on top, give it a quick egg wash before you bake. One great thing about this is that it holds together really well. I thought when I cut it the filling might fall out, but the filling baked into the dough and it all stayed in there perfectly. So it’s great finger food for a mess-free breakfast/brunch buffet and great for little fingers. My toddler loved this- and so did his parents! Also, I didn’t try it, but I’m thinking you could easily make something like this the night before and just wrap it with plastic wrap so it’s all ready to just pop in the oven when you wake up. Now starting on one end, bring the side pieces in and overlap them. You’ll want to alternate- one from the right, then one from the left and so on and so on. Does that make sense? Keep doing it until you get all the way to the end. When you get to the end, just tuck where you can to make it pretty! Then you’ll have this pretty little papoose. Yes I just called it a papoose. Isn’t it fancy? Bake according to package instructions. I believe it’s 375 for about 15-20 minutes (but who knows, I threw away my package!) It might take a little longer than the package directs because of the way it’s braided. And actually, if you want it shiny on top, give it a quick egg wash before you bake. When it’s done, it should be golden brown on top. Remove from oven and let cool for about 5 minutes. Slice on a slight diagonal and eat immediately! So next time you’re at the store, grab a tube of this crescent dough. It’s a great thing to have on hand for quick and easy meals and it gets 2 thumbs up from the Best Biters! Are you already thinking of something else to stuff into that braid? 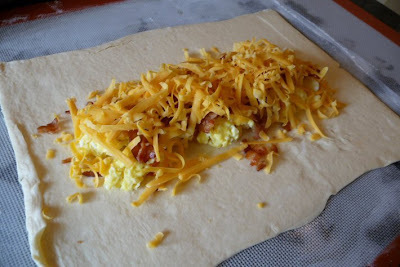 I am a little hungry and wish I had this dough in the fridge right now! That braid comes together nicely. I admit I had my doubts at the beginning of the post when you said it was easy, but that really does look easy. Well, doesn’t that just make the cheerios with bananas that I just ate look rather…wanting?! But, I bet YOUR breakfast doesn’t lower your cholesterol (or whatever it is Cheerios claims to lower). Great stuff…would be good as a giant cinnamon roll. My other idea is to fill it with the ingredients from our overnight sticky rolls caramel sauce. Ooh or cranberries and orange zest with a sugary glaze. Or that filling made with almond paste from that ‘cookie’ recipe you make with puff pastry. The possibilities are ENDLESS!!! This looks very good. Maybe it could become a new conference morning tradition…in six months! the pre-made dough sheets look revolutionary! i make this braid with homemade dough and fill it with blueberry or cherry pie filling, and drizzle a glaze and slivered almonds over the top. its a cute holiday gift, but it ends up being a bit time consuming. this looks yum and quick and easy! 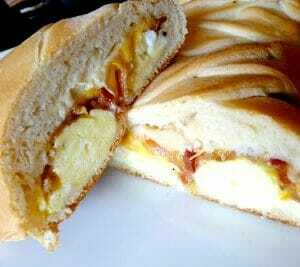 you had me at breakfast sandwich. I have made something similar called “Brunch Bread”. You mix softened (not melted) butter with a ranch dip packet and spread it around on the dough. Then add bacon, cheese, ham, turkey, whatever your fancy. 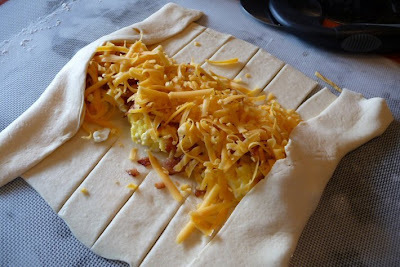 Wrap it up like you did and then add more of the butter and ranch mixture to the top. It is SO good! I’ll have to try it breakfast style! I dont know about the braid but I am excited to see the sheet w/out perforations. We make a veggie pizza appetizer (finger food)that we basically just pressed out the cressant roll dough in a cookie sheet. Then we add a ranch packet to cream cheese schmear that over the top then top with broccilli cut small and grated cheddar cheese sliced gray tomatoes, sliced black olives and chopped chives. People love it and so we do it all the time so it is nice to know that it will be easier now. I’ve done this type of thing filled with pizza fillings. It’s tastes great, I’ll have to try some new things. Dumb question probably… (not related to this post) but is there a trick to printing out the posts? first time at your blog… I LOVE that your recipe has words like Pillsbury in it. 🙂 Looks fantastic. I bet it would be good with chicken, broccoli and cream cheese. Jennifer- not a dumb question at all! The HP printing service we were using got switched up so I had to remove it. I just need to find the new code and apply it so you can print the posts again. I’ll go do it right now! Hopefully when I fix it, there will be a little printer icon at the end of the post and that should take care of it. Sorry to everyone for that glitch! er…hold that thought. Just having some technical difficulties! I’ll try to get it fixed soon! Yeah, my 21 month old will love this. Thank you, I will add some veggies also. Ok, first off I hate breakfast foods but I can’t wait to try this one! My kids would love the braid with pizza sauce, pizza toppings and cheese too. We do one for Halloween and call it the Mummy Calzone. We add two eyes (sliced olives) to the “head” so it literally looks like a mummy all wrapped up. It’s super cute and fun for parties. We also spread a cream cheese/sugar mixture on the bread and top with pie filling (hubby loves cherry). Sometimes I top it with a glaze. So delicious. Meagan- I do the mini mummies with crescent dough wrapped around hotdogs. So fun! Does the talent ever end with you two? If only I could be a little more domesticated! I’m making this in the morning and adding mushrooms! Oh baby… I made this, this morning and all I have to say is WOAH! It is SO delish… TOTALLY SO not fat free, but worth EVERY BITE! I used maple flavored bacon and sharp cheddar. I also put a pad of butter in the eggs and some season salt… YUMMMMMY! You guys saved me SO much time and money. I was ready to do a WHOLE breakfast casserole! Thanks a TON… Your TOTALLY going on my blog roll! Oh, I must be so behind in the cooking scene… but I am so happy to hear there is a sheet of this dough! I just use the perforated ones, and well, ya know… it can be a pain sometimes. 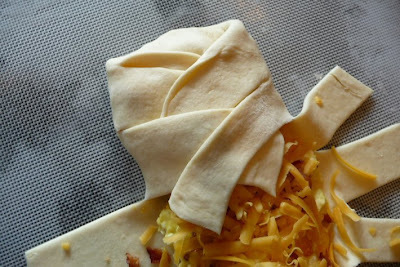 I make taco braids, or cheeseburger "pie" braids, chicken… there really are tons of things! I've read/stalked your blog for quite a few months now always wanting to make something but for some reason never did. Today I made this! YUMMY. We all agree (except my husband who hasn't eaten his yet). I'm still eating my second piece as I type. I am thinking sausage and egg….then dipped in gravy, nummy. How many would one of these serve? I'm trying to figure out how many I would need to make to feed 6-8 adults. 🙂 Thanks! Oh. My. God. I've lurked for a while, don't think I've commented much but I FINALLY made one of your recipes and this was just phenomenal. I used the regular perforated crescent rolls because I couldn't find the sheet at my local store but oh my, was it amazing. Being a college student makes time consuming cooking difficult but this was so easy, AND! its great to throw in the fridge and eat later, which may be my favorite part. This looks so good! Do you think it would freeze alright and then baked when ready to eat? Okay I admit it. I am SUCH a yeast dough virgin. I have made this dough three times now and only one time did it turn out half decent. That time, the flavor was kind of bland but that is probably because I didn’t use any salt. (My husband has high blood pressure.) Correct? My next question might sound a bit “airheady” but I need to know, since I live in Southwest Florida, like, 15 minutes from the beach, how would I treat the flour amount with regard to the elevation since there isn’t any? I literally am at sea level. Last night I thought I would make a breakfast braid for in the morning but 2-3 hrs after the dough was set out to rise, it basically looked like a bowl of glop instead of fluffy like like it had exploded from a ball. But I figured I’d go ahead with it anyway. Well, needless to say, the the dough ended up looking like and tasting like dough. Well, I didn’t actually taste it but it looked like it would taste like dough. The inside was beautiful though. I had added under 3 cups of flour where it says, “add 3-4 cups,” and was thinking that is my problem. No, I KNOW that is my problem. Please help. I can see this filled with a lite coating of butter, a layer of brown sugar, and some chopped walnuts or pecans. I would love some cinnamon filling, but can no longer eat cinnamon due to acid reflux. Where do you find the Pillsbury Crescent Recipe Creations?? just at the grocery store, by the regular crescent rolls. I’ve noticed not all stores carry them though, so if you can’t find them you can get a regular pack of crescent rolls and just pinch the seams together. 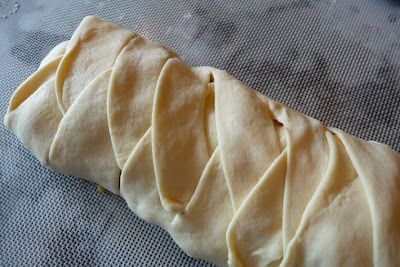 I have been shortcutting by using the Pillsbury bread dough that comes in a long skinny tube. 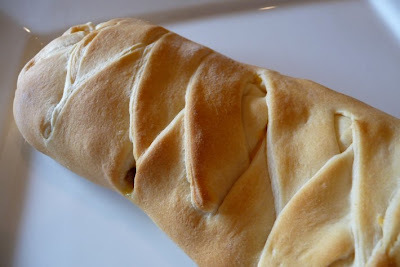 I unroll it and fill it with a mixture of hamburger, onion, green pepper and shredded cabbage, fold it over and pinch the two edges together, and the ends fold up and pinch and it is great for supper when baked like a big french bread loaf. Just follow the instructions on the tube. I think I will try to braid it next time and see how that works. Looks yummy. My family loved it when I made it. It was very simple and very quick to make. Although mine wasn’t as picture perfect as yours and looked more like a disfigured twin ( I overstuffed mine with too much fluffy eggs) the end product was just as delicious and I can’t wait to make it again :). I just made this due to already having the stuff on hand – i used 2 whole eggs + 3 egg whites, 4 pre-cooked frozen turkey sausage (i crumbled it), and shredded cheese – mine was way too overstuffed, so the original triangles from the dough kept making it fall apart AND the total thing looked terrible – besides that, it tasted wonderful and it was quick n easy! i WOULD make it again! thanks! Made this morning and was disappointed because the crescent dough wasn’t cooked all the way through. 🙁 I cooked it for 20 or so minutes at 375 and it was nicely brown. I was afraid of keeping in any longer because of the bottom getting too brown. Maybe not braid it next time? Just fold it over?